To be fair, it does have that memory foam “stink” that all memory foam products have, so if you’re not ready for that, don’t buy anything memory foam. All you need to do is air it out (or place in the dryer like I did), and the smell goes away, never to return. It comes with this pretty awesome tencil cover, which I didn’t realize when I first purchased it. Make sure you wash it before use (as you should with all new linens and bed things), and it’ll keep that pillow just like new. Very comfortable, perfect height for my multi sleep positions (side, stomach, and back depending on my mood). I hate tall pillows, and will resort to nothing most nights, but this one is just right to squish into a comfortable sleeping position. Get the perfect balance of head and neck support with the LUCID Comfort Collection Dual Zone Memory Foam Pillow. This ventilated design is breathable and features a soft zone in the center that cradles your head and a firm zone around the edges for ideal neck and shoulder support. Available in multiple sizes, thicknesses, and firmness levels, this pillow is truly customizable to your needs. I'm 5'3" 100lbs, with minor scoliosis, so neck support is important to me. Ordered the low plush loft, and it was basically flat, so no bueno there. Tried again, ordered both mid plush and high plush loft. High plush loft was too high, even though it was plush and I sunk in a bit, I still stayed too elevated. I'm sure it'll suite people who are larger than myself. I wish the mid plush loft was a bit thicker, but I found out that you can scrunch the pillow under your neck a bit and it stays conform that way all night, hence the "dough" formula. I'm a side and back sleeper, so having a versatile pillow that can support both positions is a must. Mid loft was the winner, and I slept well without it getting too hot, just wished it was a tad thicker. By the way, low and mid lofts were made of polyurethane foam so it's doughier, softer, and memorized your shape or form, maybe that's why it seemed sort of flat? While high loft was of viscose foam which made it a bit more poofy and firm, less doughy, and I noticed it didn't have as much memory. Hope this review helps. Super comfortable pillow! It has the perfect amount of firmness combined with soft memory foam. It is very supportive of the neck and doesn't seem to go flat, but is moldable to your head and neck. It seems like I usually move around a lot at night, but when I slept on this pillow, I think I stayed in one position all night! My husband and I are enjoying these 2 pillows. We bought the mid-loft plush. Decent neck support and a bit softer in center so they are comfortable for our heads without being too soft and mushy. We both have had neck pain with our old pillows and have gotten relief ! However, I am primarily a side sleeper and I have broad shoulders so I have ordered the high-loft plush to give my shoulders more room / no pain. If you are a big person side sleeper or broad shouldered side sleeper, you may prefer the high-loft plush. I have found this mid-loft plush good if I happen to roll on my back and I can still be comfortable if I am on my side but rolled a bit forward toward my stomach. My husband sleeps on his back or his side and this mid-loft plush is comfortable for him either way. This pillow is wonderful. I ordered the queen and it's perfect. Not too soft and not too firm. Good support for my neck. I love these pillow. I initially purchased the high loft pillow, but my head head was too high giving me a crook on my neck. I like the firmness so I decided to purchase the low loft and they work much better for me. Love my pillows. Husband says they were too thick so they are both mine. This memory foam pillow is very comfortable, just the right firmness and softness, ensures a very restful sleep. The pillow maintains its shape. Not as firm and thick as prior memory foam pillow, but this is a good comfort level, and less painful on my neck. Great pillow. I love this pillow it cradles my head while providing support for my neck and shoulders. I have never slept so peacefully, this is one of my new favorite purchase. outstanding quality highly recommended for anyone who loves a restful nights sleep. I am very fussy and particular about my pillows. Most of the time I sleep on my side. I have brought the same pillow on Overstock.com for several years. However, I wanted to try a different type of pillow. This one is fabulous and comfortable. I ordered a firm pillow while this is firm it is not hard like a brick. It is a memory foam pillow though I would considered it a medium firm. Been wanting this pillow for years. Never gets flattened. Marshmallowy heaven. All neck pain gone. Awesome so comfortable and relaxing. You do not have to adjust pillow in the night. This is the best pillow I have ever slept on. If you're a side sleeper you'll love this pillow. Perfect neck support. My husband and I went on a weekend trip and left his pillow behind at the hotel. Of course, his nice pillow disappeared. I spent two weeks hearing him complain about he couldn't sleep. Well complaining ended when he finally listened to me and tried this pillow. Thank you! These pillows are so great. I bought one for myself & my husband. We have had memory foam pillows for years. It was finally time to replace our old ones, but after buying many other ones, I found these. I would say definitely for side or back sleepers as the pillow is very firm and does not flatten out much. The queen pillows are a bit larger then a normal queen pillow which is also a nice added bonus. This pillow is really great, supports my neck and head in a good position and stays cool. The delivery was well before expected and well packaged. I will be buying another one. This pillow is very hard and uncomfortable. If you're looking for comfort , this is not your pillow. Laying on this pillow is like laying your head on a brick. I'm still searching for a soft but supportive, comfortable pillow. I received a totally different brand than what I ordered.. I've read another reveiw that had the same mix up happen to them receiving the Zoned Dough brand pillow. This seem to be a common problem coming out the Overstock Warehouse in Lenoir, NC.more than once. I call customer service they were prompt and quick at correcting the problem in sending me out another that will be here on the 19th so I'll review it then.. so far is right now I can't reveiw anything that I don't have. 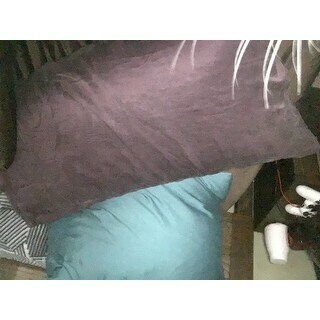 I got the high firm.I really like this pillow.I had to modify it for side sleeper.I wish you could get this in standard size.Queen is big for me.After all it is soft and supportive for me. This is best pillow I have ever used/had. Having traveled for 34 years of life and been many high dollar high class hotels; this beat them al. "I need high plush high firm"
this is a high pillow and will elevate your head and neck. I love mime I am sure you will also, as long as you like a slight elevation when you sleep.. The pillow is soft all the time and doesn't get hard when it's cold like a tempur pedic and similar pillows. I was a faithful tempur pedic pillow user for over 20 years but they started to change things and pillows I repeatedly bought every 3-4 years aren't the same any more. I tried a Serra hybrid and liked for a while but started having neck pain again. I had never heard of this brand, Z by Malouf but decided to try it and I have no more neck pain when I wake up. If you go on Malouf website it has a guide about the thickness you need depending on how many inches there are between the top of your shoulder to top of your neck, and the thickness you need to fill in this space when you lay down. Your head will sink into the pillow so it's level with your shoulder when you lay down but it will also be supported. Great brand that I'm very glad I found! This is a wonderful pillow. Plush means it is cozy, cuddly soft and supportive all at the same time. It is a perfect height. Some memory foam pillows are stiff feeling this one is not. "What are the dimensions of this pillow? Will it fit snugly into a 20" x 26" pillow sham?" Hello Mr. President, the standard pillow is approximately 16 inches high x 25 inches wide x 7 inches deep. The queen pillow is approximately 16 inches high x 29 inches wide x 7 inches deep. The king pillow is approximately 16 inches high x 35 inches wide x 7 inches deep. Thanks for shopping with us. "What does low, medium or high plush mean?" Hello Kathy A., Low, Medium, and High indicate the height of the pillow. Generally the Low is around 4”, the Mid between 5”-6”, and the High around 7” in total pillow height. The pillows are generally offered in either a Plush or a Firm density. Plush would be a softer feel, and Firm would be a higher density and more firm feel. I hope this helps. Have a great day! I have the low loft plush and it is just a little to low so I'm hoping the high loft will be just right. We are hoping this are firm pillows.